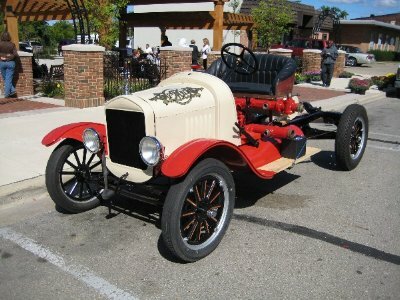 The attached photo is from an early Vintage Ford article, to 20 Horsepower, by Herb Bramley. The truck is at the Wayside Inn, Sudbury, Massachusetts. There are several questions about this truck or car. 1. Is the Wayside Inn still in Sudbury? 2. Did they own the vehicle (or who did)? 3. Where is the vehicle now (and who owns it)? 4. What company made the vehicle? 5. Why is the body much earlier than a 1924? 6. Does anyone know of another vehicle like this one (if so where)? Mt. Shasta, California fire dept. still has their 1914 Fire Chief's car. It used to be driven by the chief, but he's long gone, and now it just sits in the Sisson Museum. Has a colorful history, including the possibility that it was a stolen car when purchased by the Fire Dept! I can answer #1 - The Wayside Inn is still in Sudbury. It was owned by Henry Ford at one time. He built a grist mill there and bought the Redstone Schoolhouse from Sterling (the school Mary Sawyer from Mary Had a Little Lamb) and moved it there. Don't know about the Fire Chief's car. A man from Ohio named Brown had one like this at a show in Baltimore 20 years ago. I don't have photos of that one either. They are close, but I'm not sure how close. It wasn't unusual for departments in smaller cities and towns to update their older horse- or (even) hand-drawn apparatus by mounting parts of it on an auto or truck chassis. In this case, an older (possibly 1890s) soda-acid chemical "engine" set-up has been mounted on this T chassis. That was a pretty common conversion. The chemical equipment was probably, originally, mounted on a two (big) wheel hand-pulled cart. Soda-acid chemical rigs of this type were used for kitchen fires, and as "first response" units to hold the fire at bay until the slower, stream-powered pumpers could arrive. Interestingly, the rise of fire pumps powered by reliable gasoline engines spelled the end of the old soda-acid chemical engines like this. And the steamers too, of course. John, that sure looks a lot like the same body with no chemical tanks. Do you have any more details? It is an American LaFrance chemical truck on a T car chassis the same as mine (1917). My bell is foot operated and the photo shows the lanterns, hose basket, same foot riser...and dead dog. This is a documented fire truck from new and not a conversion from a horse drawn. It still has the original axe, shovel, and pike. 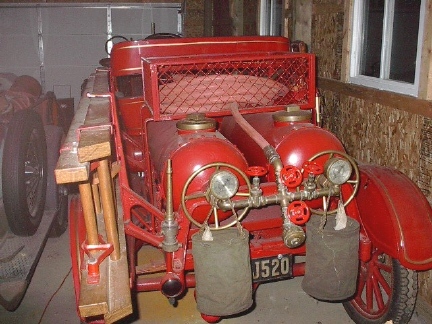 The guages read "American LaFrance". The tanks had a hatch on top that contain a basket with acid and if you remove a pin you can rotate the tank to dump the acid into the soda water to make pressure. There is a bypass valve if a pump or hydrant was available for direct pressure. 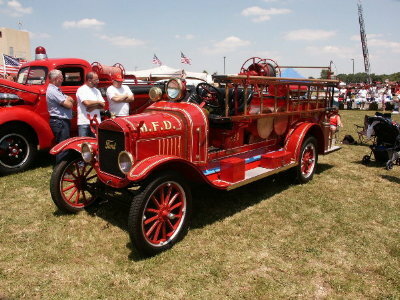 My dad had another similar American LaFrance in his amory while in the military and I worked on that one also--this was a long wait to buy mine, took 25 years. 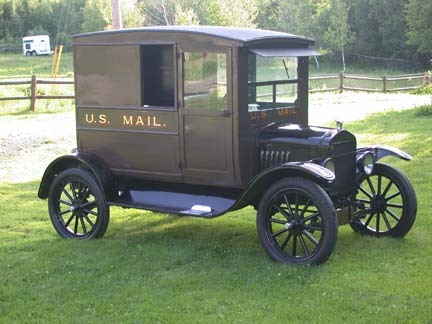 Long story there that I hope to submit to the Vintage Ford or the Model T Times someday when I find time. Most fire truck are the 1 ton with pumps and large to store. The smaller car chassis fire trucks are a little harder to find but with all fire trucks they are mostly low mileage and in good condition. This one suffered from some sheet metal rot from the acid and had been put into a ditch while on a fire run. 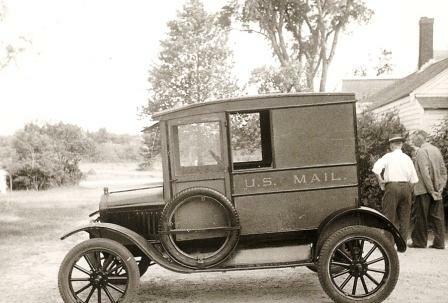 It was retired with a broken wheel in about 1928 and sold at public auction for $25. It sat until about 1955...but that is the story that needs to be told in publiction. James, many times the fire departments would update the chassis and swap over their eqipment (body, etc.) on to a later chassis. That is possibly why the 24 appears to have an earlier body. I ran across an A chemical & hose truck a few years ago that the owner said the body had been with the same department since the early teens when it was bought for a T chassis. It was swapped on to 3 different T chassis before it then moved on to the A chassis. Tim, glad to see a good picture of that truck. As a volunteer firefighter for many years, I've always liked the oldest fire trucks. Always wanted one. Yours is by far one of the nicest I've seen. Tim also sent me this photo of the tank plumbing, which looks all original, and told me I could post it. Bill Harris asked me to post this photo of a Fire Engine in a Yarmouth, Nova Scotia museum. 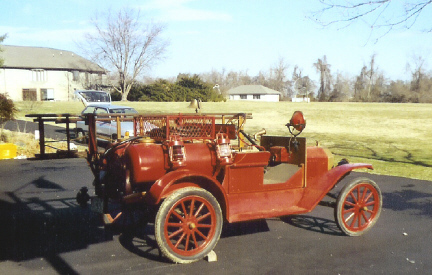 This fire engine was pulled to a fire by horses and the Model T engine only ran the pump. What a great representative of the transitional era between the horse and the automobile! 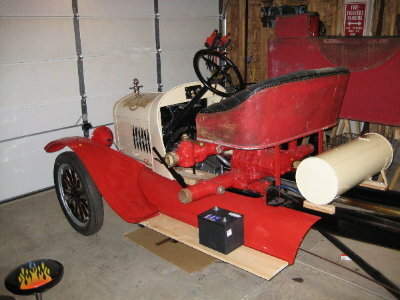 Here's My 1925 Model TT built by Luverne Fire Apparatus in Minn. I bought it back in 2002 and started to restore it last Summer. I don't have any history on this truck as far as where it served so I'm restoring it to my "secs" in ref to color and gold leafing. It's not quite done yet. I'm currently working on the hose bed. In the pictures where the new gas tank is sitting is where the chemical tank should go. The fuel tank will move to the top front of the hose bed when done. The chemical tank is the only item I don't have to finish the restoration and they are very hard to come by so I might have to design and build one. 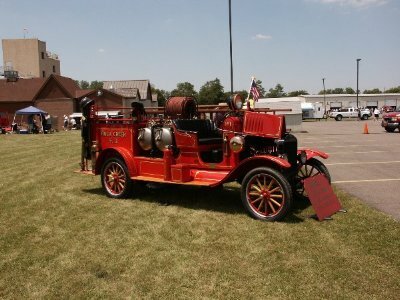 Here's a few more pic's of other Model T fire apparatus. This one is on the Truck club website as a just finished one. 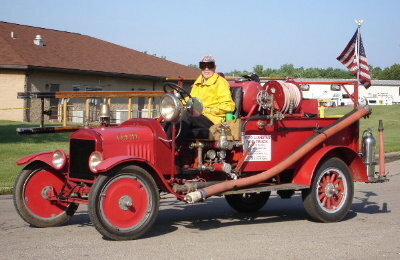 Here is a photo of the 1923 Model TT fire truck I restored for the Middleton, WI Fire Department. It took about a year to restore and I finished it in early 2007. The truck manufacturer is Obenchain-Boyer. Middleton Fire Department was the original purchaser. This truck gets driven quite a bit. Herb Bramley is a past president, and still a member of the Long Beach Model T Club. He is retired from the Long Beach Fire Department, but is still involved in the Long Beach Fire Museum, where many old fire apparatus can be seen undergoing restoration, or already restored. 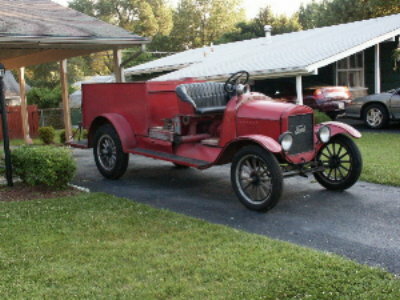 I'm not sure if Herb owned this truck, but Herb does still own a 1914 T firetruck. Tim is correct. 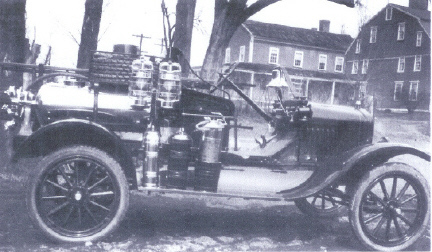 The photo is of an American LaFrance "Type A" Double Tank Chemical Fire Engine. 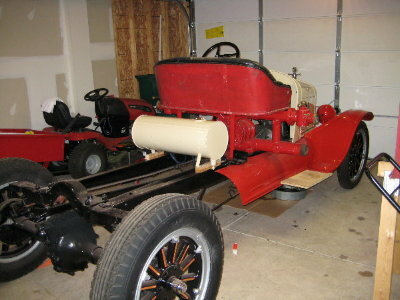 I am in the final stages of finishing restoration on my 1915 ALF "Type A" Chemical, which is serial #F107. ALF started this series of fire engines with serial #101 and the only one known to be older than mine is in Lynnfield, MA, serial #F106. 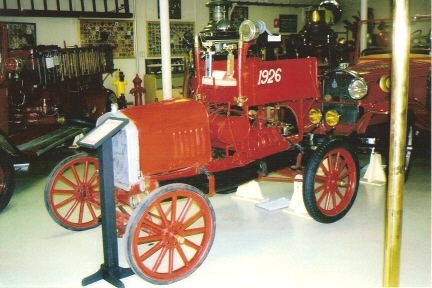 There were only 22 of these fire engines built in 1915, and over the years ALF built several hundred of them before they became obsolete with the use of more modern fire pumps and the ability to carry more water on heavy duty truck frames. David Dewey, the Mount Shasta fire engine you refer to above was owned and restored by my father, Frank Melo who was the Fire Chief for over 37 years. 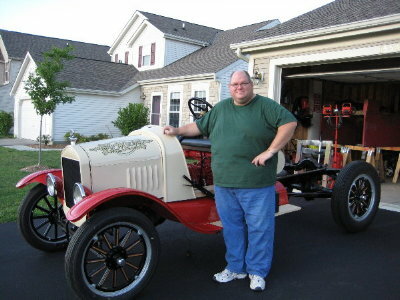 I learned to drive a Model T using my father's fire engine. 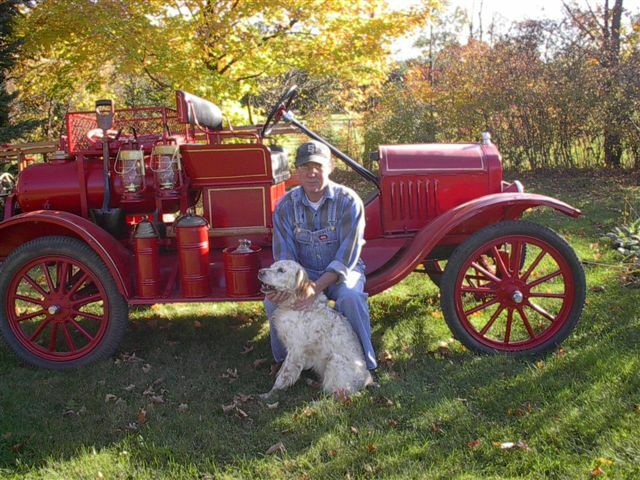 His fire engine was manufactured by the Hallock Fire Engine Company and is the only remaining Hallock known to still exist it its original condition. Wes, another question is: was the same 1915 style body used up through 1924 on those chemical cars and was all the equipment basically the same from 1915 to 1924? Wow, great to hear from you. I could not positively remember that it was your Dad, Frank, that was the chief. I seem to forget lots of stuff like that & where I put the part I'm looking for at the moment. Last time I saw the engine, it was in the Sisson Museum, and the staff claimed that no one was left in the Department that could drive it. Any truth to the "stolen vehicle" story they tell? I thought I had a pic of it, but couldn't find it (ah, there's that memory thing again). 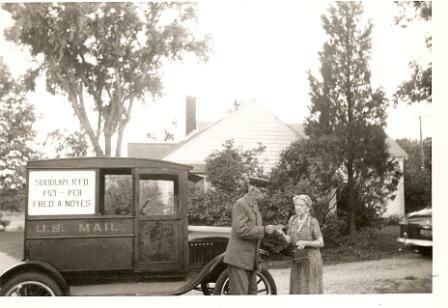 A bit off topic but my T Mail Truck may have passed that Fire Truck in Sudbury once or twice. 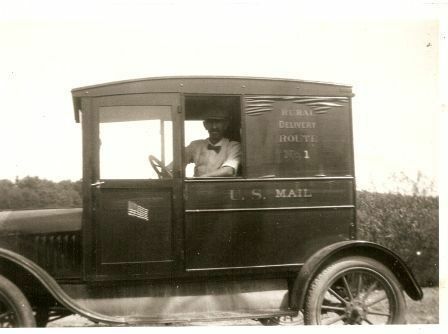 My Great Grandfather delivered all the mail in town with this truck through '31. Fist photo (bottom left) was taken in the 20's when the panel delaminated. Second (top left)some time in the 30's or 40's and the last in the mid 50's (top right) (look at the Elm in the back ground - same tree) and today (bottom right) We lived up the road from the Way Side Inn. See you in Centerville! This is a photo of my friend's fire car that we are trying to positively identify. 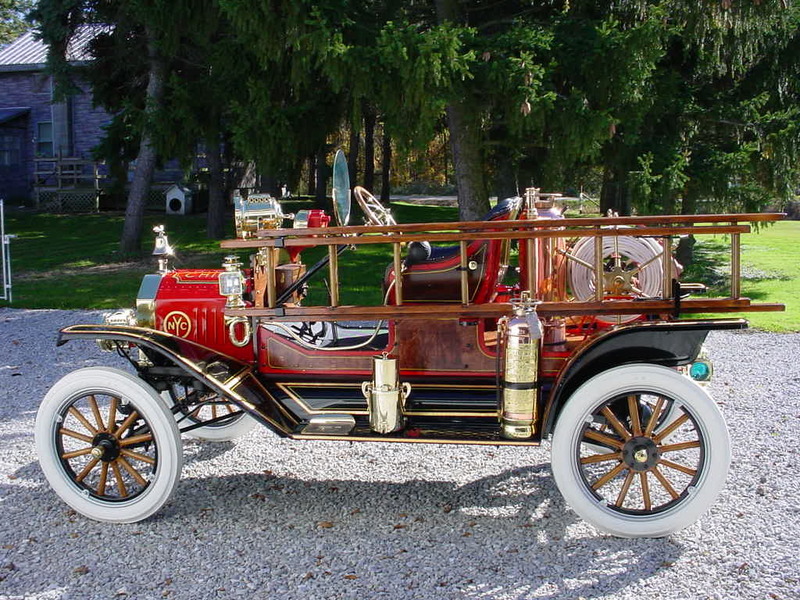 "Firefighting with Henry's Model T" is the title of my next book on fire apparatus and will be published in June, 2008 in time for the !00th Anniversary celebration of the Model T. The response with information and pictures has been remarkable and includes well known authors and experts on fire apparatus in North America. 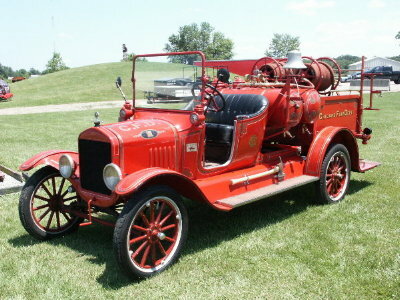 I would appreciate receiving any information and photos of Model T fire apparatus for my book. The International Association of Fire Chiefs Foundation, the MTFCA Museum and the National Fire Heritage Center will receive royalties from book sales. The phtogoraphs preveiously published on the Forum are helpful, I just need more information about each of the vehicles. Please feel free to contact me regarding this project. One of the by-products of this project is an Excel spread sheet on Model T Ford fire vehicles which will be made available to interested parties. Thanks for your assistance. Your friend's rig tooks like a Ford LaFrance.